Spending connected to Starkey Hearing Technologies surpassed Medtronic, Boston Scientific and Edwards Lifesciences during the 2018 election cycle. A hearing aid company that claims Ronald Reagan as its most famous customer has kept a low profile over the past decade. But the company has revved up its dormant lobbying engine in Washington as FDA action looms on the horizon, pitting itself against audio equipment maker Bose, who poses a threat to its bottom line. The marked increase in Starkey Hearing Technologies-linked contributions during the 2018 election cycle catapulted the company above major medtech firms' political spending. Starkey-related contributions from individuals and political action committees add up to $687,317 — totaling more than such spending by medical device giants like Medtronic, Boston Scientific and Edwards Lifesciences, as well as the medical device trade lobby AdvaMed. The substantial uptick comes as the firm, which controls a significant portion of the market, fights to shield itself from looming hearing aid deregulation that could jeopardize its business. Congress mandated FDA create a new regulatory category to allow over-the-counter hearing aids in 2017. Privately owned Starkey took special interest in having its voice heard during the debate over the legislation, enlisting high-powered lobbyists including former Minnesota Sen. Norm Coleman to advocate on its behalf, according to lobbying disclosures. While it failed to stop the legislation from becoming law, it continues to spend money on lobbying. After spending virtually nothing on lobbying for more than a decade, Eden Prairie, Minnesota-based Starkey has spent $865,000 since the beginning of 2017, up from an earlier high of about $20,000 in 2004. Starkey President Brandon Sawalich said the company "enjoys having these conversations," and doesn't see lobbying "slowing down," in an interview with MedTech Dive. He argues hearings aids are a personal device needing fine tuning by professionals to ensure patient safety. Of the company's affiliated contributions during the 2018 election cycle to parties, candidates and leadership PACs, 80% went to Republicans, leaving 20% for Democrats, according to data from the Center for Responsive Politics. 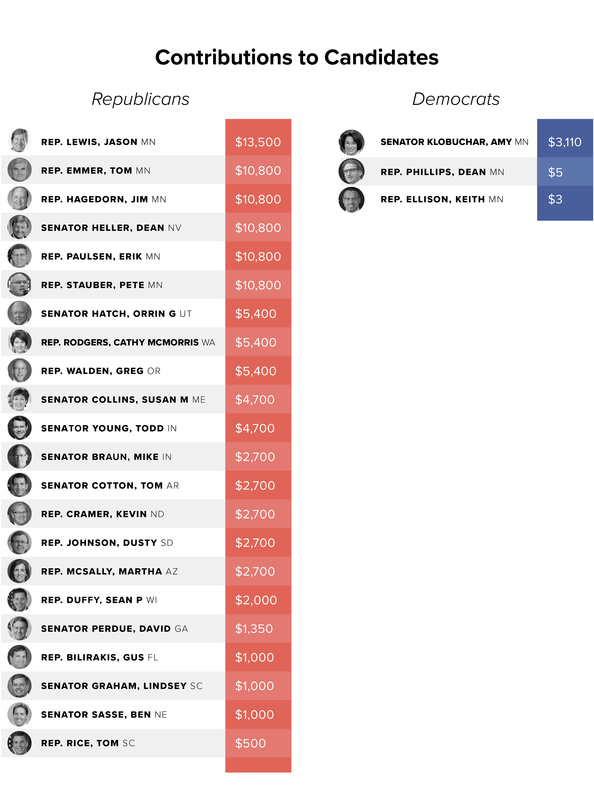 Starkey Hearing Technologies-related political contributions during the 2018 cycle. The proposal to deregulate hearing devices for those with mild-to-moderate hearing loss came to the forefront when former President Barack Obama's President's Council of Advisors on Science and Technology released a report in 2015 touting its potential to "simultaneously decrease the cost of hearing aids, spur technology innovation, and increase consumer choice options." The National Academies of Science, Engineering and Medicine followed with a similar report in 2016, which found many barriers facing patients seeking a hearing aid. For example, FDA requires individuals to obtain a physician evaluation or sign a waiver before being able to purchase a hearing aid. Cost is also a significant barrier. According to the 2016 report, "the average retail price for a pair of hearing aids in 2013 was $4,700," including costs of services. Heavyweight lawmakers such as Sens. Elizabeth Warren, D-Mass., and Chuck Grassley, R-Iowa, as well as Reps. Joe Kennedy, D-Mass., and Marsha Blackburn, R-Tenn., jumped on the idea to open up the hearing aid market. The Over-the-Counter Hearing Aid Act of 2017 passed into law as part of the FDA Reauthorization Act of 2017. Despite Starkey's concerns, it does not look like FDA is keen on taking its foot off the gas with its plan to move ahead to promulgate an OTC category of hearing aids. The agency plans to issue a proposed rule in November 2019, almost a year before its statutory deadline of Aug. 18, 2020. "The FDA is committed to ensuring that individuals with hearing loss have options for taking an active role in their health care," Malvina Eydelman, director of FDA Center for Devices and Radiological Health Division of Ophthalmic, and Ear, Nose and Throat Devices, said in a statement in October. 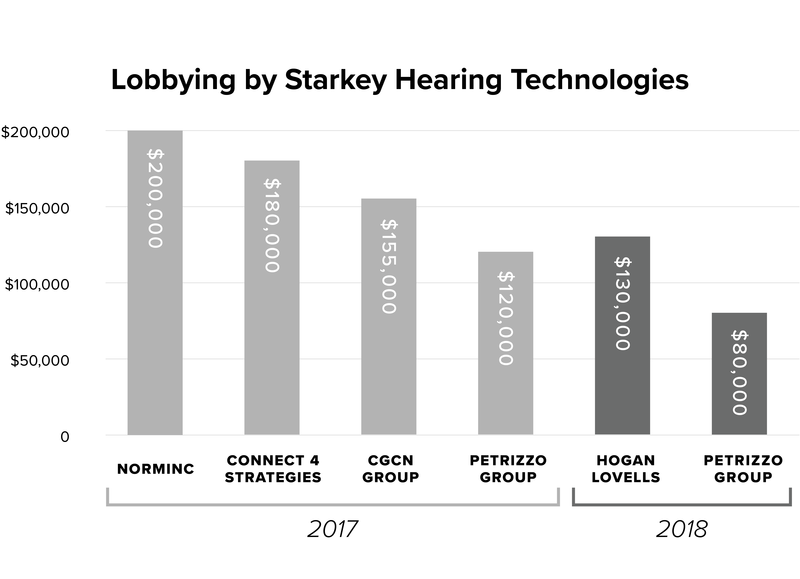 Lobbying by Starkey Hearing Technologies during 2017 through the third quarter of 2018. Starkey has engaged directly with regulators. On Dec. 13, 2017, Starkey CTO Achin Bhowmik and chief architect and technical fellow Jon Kindred alongside Sidley Austin lobbyist Nancy Stade met with FDA to discuss hearing aids. Top FDA officials including CDRH Director Jeff Shuren, Associate Director for Digital Health Bakul Patel and Eydelman were among agency representatives. FDA declined to comment on contents of the meeting. "Whatever happens in D.C. government-wise, fine, but I have 5,300 great employees here, and cutting-edge technology that we have got to deliver," Sawalich said. "The more members of Congress and agencies that want to have discussions and learn, I'm all for it." Entrenched hearing aid companies have little reason to support changes in part due to the field being "controlled by a few companies and the audiologists that work for them," Christine Cassel, a UCSF presidential chair and a former member of Obama's science panel who helped write the hearing aid report, told MedTech Dive. "It just seems crazy that hearing aids haven't become much less expensive, much like every other type of digital technology, and much more user friendly," Cassel said. Starkey is not the only company interested in the space. In an effort to disrupt the industry, audio equipment manufacturer Bose has spent $530,000 since 2016 to retain the Alpine Group to lobby on FDA issues, the passage of OTC legislation and implementation of the signed law. Height Capital Markets analyst Andrea Harris predicts that the potential OTC regulations will be a boon to Bose, which gained marketing authorization in October for the first self-fitting hearing aid that can be programmed without assistance from a healthcare provider. The National Academies report noted that the 67% to 86% of U.S. adults "who might benefit from hearing aids do not use them," a population Bose's product could be well positioned to serve. In 2016, Bose argued to FDA that the safety concerns that underpinned FDA's original 1977 hearing aid regulations are no longer a legitimate reason to maintain the status quo. "Scientific and technical advances have effectively overcome all obstacles to OTC hearing aids that then existed," Bose wrote. "We firmly believe that the risks of making OTC hearing aids available to consumers are genuinely very small and that OTC hearing aids have the potential to dramatically change the affordability and access to hearing aids." Bose told MedTech Dive it is pleased with FDA's public comments in a statement, but did not respond to a request to discuss its lobbying efforts. The regulations appear to pose a material risk to Starkey's business model. A research note from Cowen Washington Research Group says that the proposal will likely lower the costs of hearing aids and allow new players to disrupt the hearing aid market currently occupied by companies like ReSound, Sonova and William Demant. "While these changes would likely disrupt the current business practices of hearing aid manufacturers and dispensers, they would also dramatically increase competition and increase new choices for the millions of Americans who will soon be experiencing hearing loss for the first time," the Obama science council report states. Another area of interest to Starkey is selling hearing aids to the U.S. government. A 2018 Starkey lobbying disclosure stated that the company has been lobbying the Department of Defense on an "advocacy initiative to advance adoption of hearing health standards throughout the U.S. Government for acquisition and deployment of hearing aids." The Department of Veterans Affairs is already one major purchaser of hearing aids. VA spokesperson Terrence Hayes told MedTech Dive that in fiscal 2018, the department purchased 786,741 hearing aids through its national contract at a cost of $291,875,369.11, or about $371 per hearing aid on average. According to data from the VA, Starkey represented $52,057,705 of that total, or 15.85% of the total number of VA-purchased hearing aids. 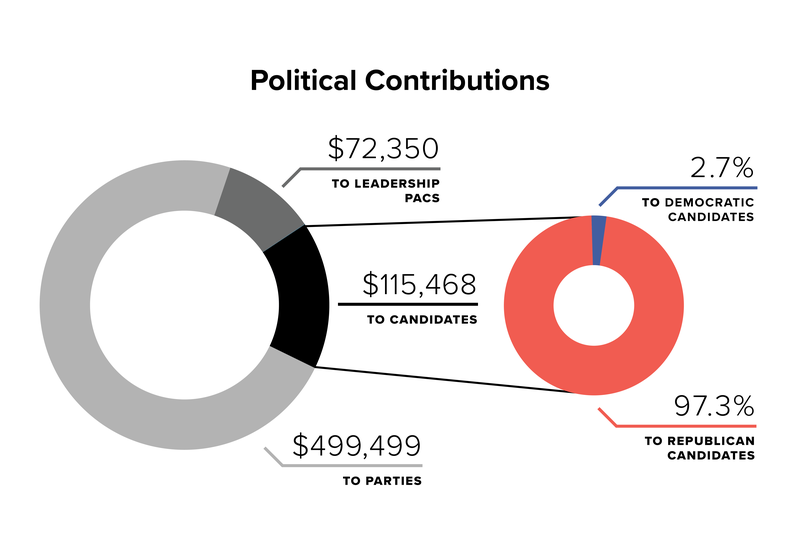 Starkey Hearing Technologies-related political contributions to specific candidates during the 2018 cycle. In 2015, an VA Office of Inspector General audit found that despite tinnitus and hearing loss being the most prevalent service-connected disabilities for veterans, the VA struggled to timely issue new hearing aids on top of addressing a backlog of more than 19,500 sealed packages waiting for repair. The following year Congress passed the Veterans Mobility Safety Act, which directed VA medical facilities to "provide to veterans access to the full range of professional services provided by an audiologist." "Our recent lobbying efforts have been focused on educating Congress and the DOD about the prevalence of hearing loss and the associated impact on overall health and wellness," Sawalich said in a statement to MedTech Dive. "We believe it is imperative that elected officials and policymakers understand the importance of and steps to prevent hearing loss among our enlisted men and women and all Americans." While Starkey lost the fight to prevent a move toward OTC, it is keen on protecting the term "hearing aid," and its view that people with severe hearing loss still need to see an audiologist to help with fittings and service. In addition to his duties at Starkey, Sawalich is the chairman of the Hearing Industries Association, an industry trade group that endorsed recommendations on how FDA should approach OTC hearing aids made by the American Academy of Audiology, Academy of Doctors of Audiology, American Speech-Language-Hearing Association and International Hearing Society. The advice, laid out in an August consensus paper by the four hearing associations, lends a clue on how the hearing industry is attempting to protect itself from deregulation. While industry says it "fully supports any effort aimed at making hearing care solutions more accessible," it is advocating that the FDA promulgate regulations that "include safeguards that optimize consumers' awareness and use of appropriate hearing care treatment." The group wants the FDA to require a "concise, outside‐of‐the‐box labeling appropriate for OTC, with a strong recommendation to consult with a hearing healthcare professional," and classify the OTC category not as hearing aids, but rather "Self-Fit Over-the-Counter Hearing Devices." The group also argues FDA should require a 510(k) clearance for the first device by each new manufacturer in the new OTC category and risk profile as a Class I or Class II medical devices, comparable to hearing aids on the market today. Sawalich emphasized that Starkey does not sell hearing aids directly to patients, instead selling the devices to hearing professionals to ensure patient safety. "Hearing aids are service and care, they are not just grab and go. It's something you are wearing all day and you have got to fine tune it and there is a lot of service that comes with it," Sawalich said. But the National Academies report found "no evidence that the required medical evaluation or waiver of that evaluation provides any clinically meaningful benefit." Given the rarity of adverse medical conditions, removal of the FDA's requirements on physician evaluation prior to obtaining a hearing aid would benefit patients, it states. Despite Starkey's efforts, it may not have the ear of FDA Commissioner Scott Gottlieb, who called the current framework outdated in October, saying looser regulations will allow for efficient patient access to innovative products.